To clean laboratory glassware and other equipment. They are filled with appropriate cleaning liquids, and poured over the tool that needs to be cleaned. A wash bottle is a squeeze bottle with a nozzle, used to rinse various pieces of laboratory glassware, such as test tubes and round bottom flasks. Wash bottles are sealed with a screw-top lid. When hand pressure is applied to the bottle, the liquid inside becomes pressurized and is forced out of the nozzle into a narrow stream of liquid. Most wash bottles are made up of polyethylene, which is a flexible solvent-resistant petroleum-based plastic. Most bottles contain an internal dip tube allowing upright use. Wash bottles may be filled with a range of common laboratory solvents and reagents, according to the work to be undertaken. 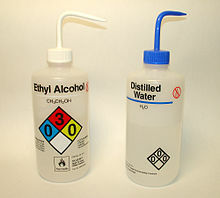 These include deionized water, detergent solutions and rinse solvents such as acetone, isopropanol or ethanol. In biological labs it is common to keep sodium hypochlorite solution in a wash bottle to disinfect unneeded cultures. There are a consistent set of colour codes and markings used to identify the contents of wash bottles. Red is used for acetone, White for ethanol or sodium hypochlorite, green for Methanol is yellow for isopropanol and blue for distilled water. Safety warning labels are also used to identify potential hazards. Where reagents with high vapour pressure are used such as ethanol or methanol, small pressure release holes are incorporated into the cap to release and excess vapour pressure and avoid material being ejected through the nozzle when not in use. The use of wash bottles helps rusers control and measure the precise amount of liquid used. In addition, unwanted substances or particles cannot pass through wash bottles. The use of wash bottles is more convenient than using beaker and graduated cylinders. Different types of wash bottles are suitable with different types of substances. A spiral gas-lift wash bottle, for example, is suitable for eliminating gas with the liquid system having two phases like bromide and water. In addition, a Simple graduated wash bottle helps determine the amount of liquid used. A type of strong solvent and a type of destructive substance can be dealt with Nalgene Teflon FEP wash bottles since the special type of plastic is used to produce this type of wash bottles. A hole wash bottle lids necessary for acetone and methanol. The back of wash bottles with labels for indicating types of substances inside. ^ Woodrift, Ray (July 1940). "A Convenient Type of Wash Bottle". Chemical Education. 17 (7): 323. Bibcode:1940JChEd..17..323W. doi:10.1021/ed017p323. Retrieved 3 March 2017. ^ Rudolph, Goetz (October 1977). "Wash bottle for volatile solvents". J. Chem. Educ. 54 (10): 634. Bibcode:1977JChEd..54..634G. doi:10.1021/ed054p634. Retrieved 9 March 2017. ^ Kjonaas, Richard A. (June 1984). "Storage of laboratory wash bottles". Chemical Education. 61 (6): 541. Bibcode:1984JChEd..61..541K. doi:10.1021/ed061p541. Retrieved 3 March 2017. ^ B. B., Corson (November 1938). "Absorption efficiency of spiral gas-lift wash bottle". Analytical Chemistry. 10 (11): 646. doi:10.1021/ac50127a015. Retrieved 17 March 2017. ^ Earle R., Caley (July 1929). "Simple graduated wash bottles". Analytical Chemistry. 1 (3): 162. doi:10.1021/ac50067a027. Retrieved 17 March 2017. ^ Nalgene® Wash Bottles, Nalgene® Wash Bottles (October 1973). "Wash Bottles". Analytical Chemistry. 45 (12): 980A. doi:10.1021/ac60334a720. Retrieved 17 March 2017. Wikimedia Commons has media related to Wash bottles. This page was last edited on 5 February 2019, at 09:31 (UTC).